This is the first full-scale reference grammar of Classical Greek in English in a century. The first work of its kind to reflect significant advances in linguistics made in recent decades, it provides students, teachers and academics with a comprehensive yet user-friendly treatment. 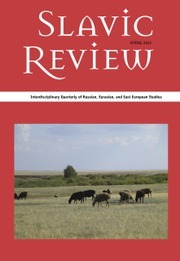 The chapters on phonology and morphology make full use of insights from comparative and historical linguistics to elucidate complex systems of roots, stems and endings. The syntax offers linguistically up-to-date descriptions of such topics as case usage, tense and aspect, voice, subordinate clauses, infinitives and participles. An innovative section on textual coherence treats particles and word order and discusses several sample passages in detail, demonstrating new ways of approaching Greek texts. Throughout the book numerous original examples are provided, all with translations and often with clarifying notes. Clearly laid-out tables, helpful cross-references and full indexes make this essential resource accessible to users of all levels. Evert van Emde Boas is Leventis Research Fellow at Merton College, Oxford. He has previously held teaching and research positions at four universities in the Netherlands, and at the Calleva Research Centre at Magdalen College, Oxford. He specializes in the application of modern linguistic and cognitive approaches to ancient Greek literature, and is the author of a monograph and several articles on Greek tragedy. 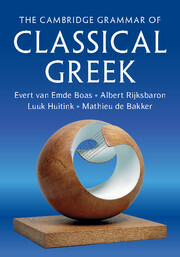 Albert Rijksbaron is Emeritus Professor of Ancient Greek Linguistics at the Universiteit van Amsterdam. His publications include Temporal and Causal Conjunctions in Ancient Greek (1976), the widely used The Syntax and Semantics of the Verb in Classical Greek (1984; 3rd edition 2007), Grammatical Observations on Euripides' Bacchae (1991), a highly acclaimed edition with a (linguistically oriented) commentary of Plato's Ion (2007), as well as numerous articles on Greek linguistics. He is also the editor of the collective volume New Approaches to Greek Particles (1997), and co-editor of Sophocles and the Greek Language (2006) and The Historical Present in Thucydides (2011). Luuk Huitink as taught at the University of Oxford and the Universiteit Leiden. A trained classicist and linguist, he is currently a postdoctoral research fellow on the European Research Council (ERC) Project 'Ancient Narrative' at Universität Heidelberg, where he examines the relationship between ancient rhetoric and cognitive linguistics in order to shed light on the ancient readerly imagination. 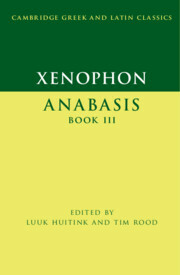 He is also, together with Tim Rood, preparing a commentary on Xenophon's Anabasis III for the series Cambridge Greek and Latin Classics (which will be keyed to this Grammar). He is the author of several articles on linguistics and narratological topics in classical and post-classical Greek. Mathieu de Bakker is university lecturer in the Department of Classics at the Universiteit van Amsterdam, where he teaches courses on all aspects of ancient Greek. He has published on the Greek historians and orators, and is co-editor of Myth, Truth, and Narrative in Herodotus' Histories (2012).